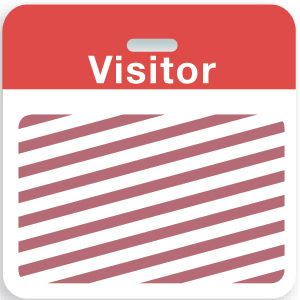 The badge features a red tab and slot punch at the top of the card with the word ‘Visitor’. The bottom of the card is for an expiring temporary badge. You must use a manual or thermal printed temporary badge on top of this card in order to have the expiration badge activate. Red lines seep through to the front part of the badge and indicate when the badge is no longer valid. Expiration happens after a half-day (4 hours) or a full day (8 hours) depending on the front visitor badge used.